Save AED 11.25 (25%) – Earn 3 Shukrans What is Shukran? Shukran is the Landmark Group’s award-winning loyalty programme in the Middle East, which allows you to earn Shukrans when you shop any of our brands. Highlight your features and get a flawless glow by applying this alluring bronzer. 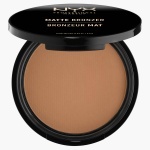 Comes in a matte finish, this bronzer will go well with any skin tone making you look gorgeous.